You know that saying about the best-laid plans of mice and men? It’s been that sort of week for me. I know I don’t talk about myself much on this blog outside of what I cook on a day-to-day basis. Cooking is a big part of my life, but obviously more goes on than food prep and happy devouring of finished dishes. Unfortunately, since about last Thursday, the “more” has consisted of spending a lot of time with my family by my grandmother’s bedside. She’s 93 and we’re pretty sure it will be her time to go very soon. On the one hand, we’ve all been prepared for the eventuality for a while now; on the other, it’s emotionally draining to watch someone you love go through the process of dying. It’s not something I’ve been close to all that often in the course of my life, and as a result I don’t have many coping mechanisms at hand to help me get through it. Oddly enough, cooking is one of the things that keeps me grounded. I thank God on a regular basis that my family always has an amazing amount of food on hand. I can get up in the morning with a meal idea and run with it, not having to worry about being short of ingredients and never having to worry about going hungry. So naturally one of the first things I did when it became clear that we were going to be sticking close to my grandmother for several days was to pack up the Memorial Day dinner I had planned and haul it down to where we’re staying. What’s a Memorial Day dinner without something “All-American,” right? Here they are again, those ubiquitous portabello mushrooms that are always on sale during grilling season. Instead of running out and grabbing a package of vegan hot dogs like I was originally planning, I went with a marinated portabello burger recipe from 1,000 Vegan Recipes. They were supposed to be grilled, but given the circumstances I improvised with a big skillet-style pan. The marinade was a pretty basic olive oil/balsamic vinegar concoction, which I drizzled the mushrooms and onions with as they were cooking. 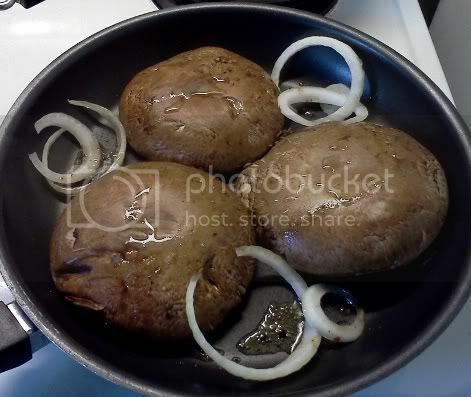 It had the effect of making the mushrooms extra-moist and turning the onion a lovely light brown color. In the meantime, I had these baking in the oven. Yes, these are actual baked beans, courtesy of Happy Herbivore! I’ll confess that the last time I had baked beans, they were the vegetarian type out of a can. 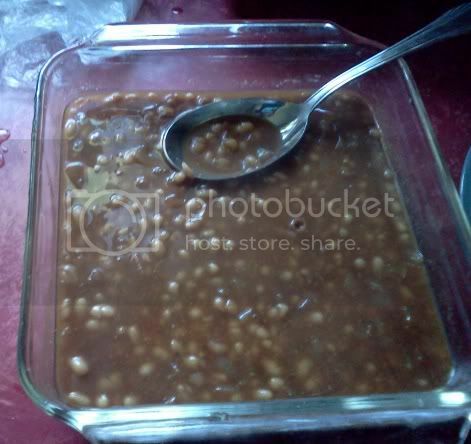 Never before have I made baked beans from scratch. Of course, now that I have, I’m wondering what the heck took me so long. These were delicious! They didn’t thicken up as much as I was expecting, but that may have been because I left the aluminum foil covering on after taking them out of the oven. The sauce seemed to get more viscous after I took it off and they sat through dinner. I’ll have to try that the next time I make them. Also, I loved the addition of a small amount of cayenne–it gave the whole dish a tasty little kick! 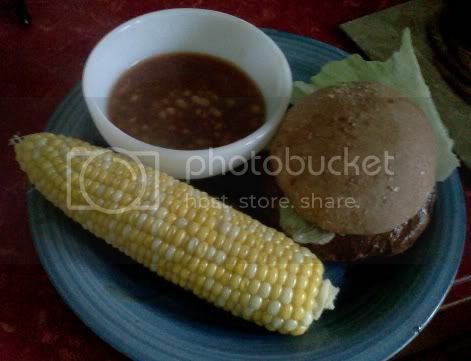 And of course, what summery meal is complete without fresh, sweet corn on the cob? If you’ve read this blog at all recently, you know that I’ve been snapping this stuff up on sale every chance I get, and this time was no exception. This corn was so good that it didn’t need anything extra to taste just right. The buns for the portabello burgers were whole wheat from Rudi’s Organic Bakery, which I ran across at the co-op…also very good! Everything went together extremely well and made for an enjoyable meal. I miss cooking in my own kitchen, but I’m grateful that I can still put together good homemade meals even in the midst of everything that’s going on. Tomorrow night we’ll be taking a break and ordering in, but Thursday I’ll be back to cooking, keeping myself sane with food. That’s not so weird, is it?